Effective, Accessible Transport in Cape Town: What can be done? The DG Murray Trust is a private, grant-making foundation based in Cape Town. By investing in social ideas and untried ventures with the potential to impact and enable vulnerable individuals and communities, the foundation aims to identify and tackle critical areas of market-failure. Loyal to its goals, the DG Murray Trust looks to work with and influence institutions to encourage a more long-sighted approach to development initiatives and donor investment. One of the foundation’s five portfolios – Inclusive, Enabling Communities – looks to tackle fundamental inefficiencies in the way that services are planned, funded, administered, monitored, and ultimately, delivered. Foremost in their approach is to streamline and improve underperforming systems with the potential to do more in addressing the needs and institutional hurdles facing society’s most vulnerable citizens. Under this banner, the DG Murray Trust identified a deficiency in how Cape Town’s public and private transport systems caters for the complex travel needs of People with Disabilities (PWDs). In mid-2015, DG Murray Trust awarded Imani Development to undertake research to understand the challenges faced by PWDs, and to explore and design a set of feasible and sustainable solutions for the transport sector in Cape Town. As the starting point, a pre-feasibility study was commissioned to explore the questions: (i) “Why do people with disabilities in Cape Town have insufficient transport?”, and (ii) “Does a market exist in this space for a sustainable business to provide more appropriate options?” The pre-feasibility study adapted a comprehensive systematic approach to unpack the various themes identified. It measured the gap between demand and supply, benchmarked ways to improve the efficiency of important operational functions, and conceptualized complementary business enterprises with the potential to help alleviate critical components of the problem. The first part of the work provided analysis of the context, exploring the intersection between disability and transport, and its importance to the development agenda. An important insight was to view disability as both a medical condition and a social experience. The social component of disability captures the degree to which PWDs are further disabled by social, structural and psychological barriers prevalent in society. This understanding was crucial to the approach of the report as it suggested that if the social component of disability is a perceived experience, then that perception can be moulded and changed. Misunderstood: In addition to physical difficulties, disability includes difficulty with sight, hearing and cognition. Mobility plays a critical role in reducing the negative effects of the disability/poverty cycle, and the process of increasing mobility options for PWDs involves identifying and reducing prevalent access barriers. 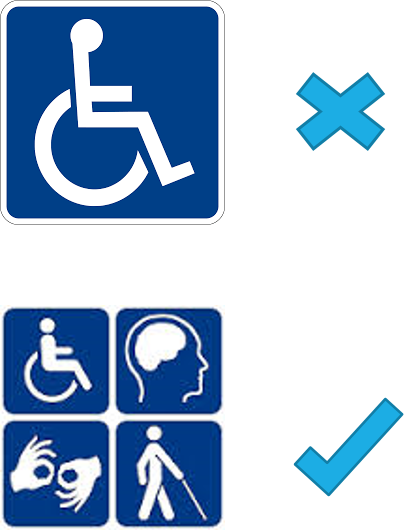 In order to do this, it is important to recognize that PWDs are not a homogenous group. The disabled population in South Africa is defined by a wide vertical variation of income and a wide horizontal variation of disability, translating into a wide variation of need. Pertinently, this means that the market for specialized PWD transport is highly segmented, and that any solution must therefore address a number of nuanced components. The second part investigated and measured the gap between demand and supply in the disability transport sector. The market research methodology involved capturing a combination of non-random quantitative and qualitative primary data through three channels: a set of 36 stakeholder interviews, a user survey comprising 47 participants, and 4 comprehensive focus groups of 7-8 participants each. Participants were of varied income, age, and disability – and were selected through their affiliation to prominent representative organisations, and their willingness to opt-in to the research. The focus group discussions were two hours in duration, video recorded and fully transcribed. This data was augmented by desktop research, and provided a rich foundation for analysis. Amongst the findings, it emerged that suppliers of transport for PWDs face internal and external factors that make operating in the sector inherently expensive and inefficient. This presents a significant challenge: either ticket prices must be set high enough to ensure revenue covers costs, or revenues must be artificially increased using subsidies. As the former option would likely translate into an unaffordable service, transport subsidies in South Africa have been commonplace for over half a century. However, particularly when it comes to specialized PWD transport, the heavy use of state-subsidized operating support has had the unintended consequence of grossly distorting the market. This distortion affects both the supply and the demand side. On the supply side, it has raised the perceived barriers and costs to market entry, and has inhibited private sector interest in providing PWD-focused transport services. On the demand side, the distribution of the subsidy has been regressive, with 100% of the benefits shared between those who qualify for the City of Cape Town’s Dial-a-Ride service – a relatively small subset of those that need its services. This has caused an imbalance in the distribution of affordable transport across Cape Town’s population of PWDs, and has skewed the way various sub-groups of PWDs understand the relative costs of transport. As a result of these collective factors, the supply of tailored transport for PWDs is significantly lower than the market would dictate otherwise. The findings of the demand analysis add credence to this conclusion, suggesting that there are realizable business opportunities in the sector. PWDs would be willing to pay substantially more than the fares charged by mainstream transport for a service that was safer, easier to use, and more reliable. In addition, there is particular need for appropriate ad-hoc services that are available on demand, and for services tailored to help address specific difficulties along journeys such as getting from door to pick-up and destination to drop-off points. An important finding was the absence of new technologies within the sector, and that greater incorporation of technological innovations had the potential to improve the coordination, safety and efficiency of operations. In turn, it became apparent that combining selective interventions and technological innovations could help to considerably improve the experience and functionality of transport for PWDs in Cape Town. With these insights, the final two parts of the study examined how to incorporate ideas from international examples of effective PWD transport into a set of viable business options. These business options were presented to the client, and will inform the direction of planning and piloting going forward. If these activities reveal the potential to achieve financial viability and sustainability, this social enterprise has the potential to greatly alleviate some of the deficiencies in Cape Town’s transport sector. By consequence, this venture could mark a significant juncture in enabling People with Disabilities to become more included, vibrant members of Cape Town Society, and in spreading awareness of the role transport can play in making this happen.